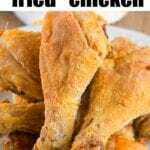 Easy air fryer fried chicken recipe! With a light breading these chicken drumsticks, wings or breasts will have moist meat but a nice crispy outside. Do you have a Ninja Foodi pressure cooker and air fryer yet. Or maybe you have another brand and are ready for something crispy for dinner. Whatever style you might have will work for this throw together meal. 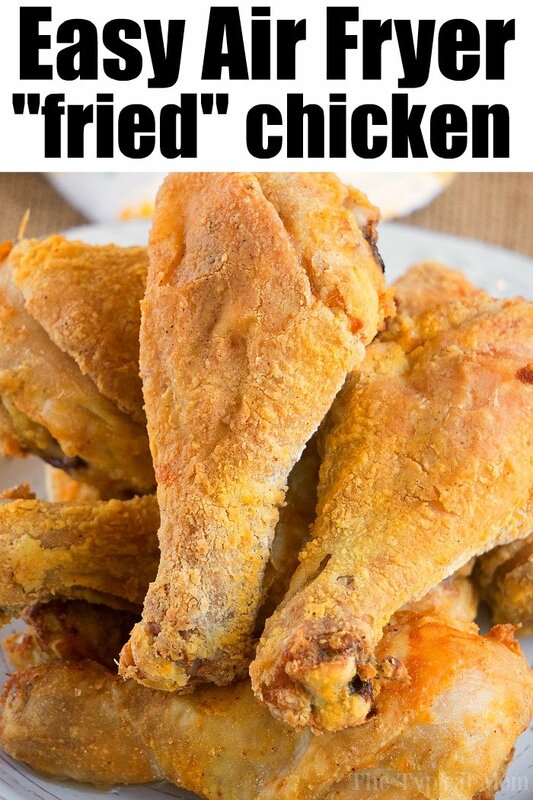 You’ll find more air fryer recipes here too. Join my Ninja Foodi EASY Recipes Facebook group for more easy air fryer recipes. 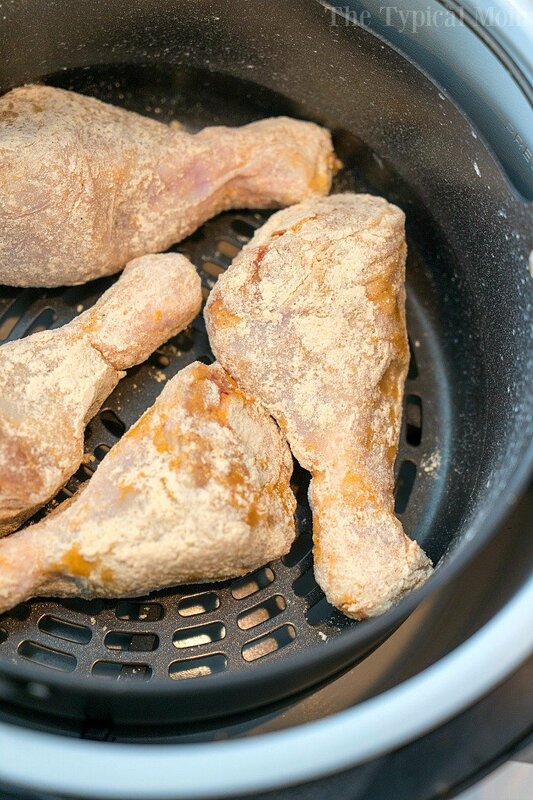 “Frying” chicken in an air fryer has never been easier using this method! Find this and more on our Ninja Foodi recipes post. This is what I used, literally 3 ingredients is it! I coated these two different ways. The Louisiana chicken fry mix we used was great because it already had a bit of spice and spices inside. That way I didn’t have to add anything. Just rub on olive oil, shake on mix, air fry. We love this method because as much as we love fried foods sometimes, deep frying isn’t good for us. Then you can make a side dish like our air fryer tater tots to go with this! Note: Timing below works well for medium size chicken legs. If cooking chicken breasts I would recommend medium size and cutting them in half so the middle cooks as evenly as the edges. Breasts will take longer than any other chicken pieces. Air fryer chicken wings will take the least amount of time. Use this printable air fryer cook times sheet for reference. Make sure they’re in a single layer and not overlapping. If you stack chicken they won’t cook evenly or crispy all the way around. Turn on air fryer (or use air crisp button on Ninja Foodi). Timing will depend on how thick your meat is but should be done in 30 minutes or less. Before last 2-4 minutes spray chicken pieces with olive oil to really crisp up the outsides. Eat or drizzle barbecue or hot sauce on top. Using this method you can have crispy chicken pieces in about 25 minutes! If you don’t have an air fryer, here’s how to bake crispy chicken wings in the oven. Our air fryer chicken thighs. You can find more air fryer dinner recipes here, and print directions below to keep them handy. 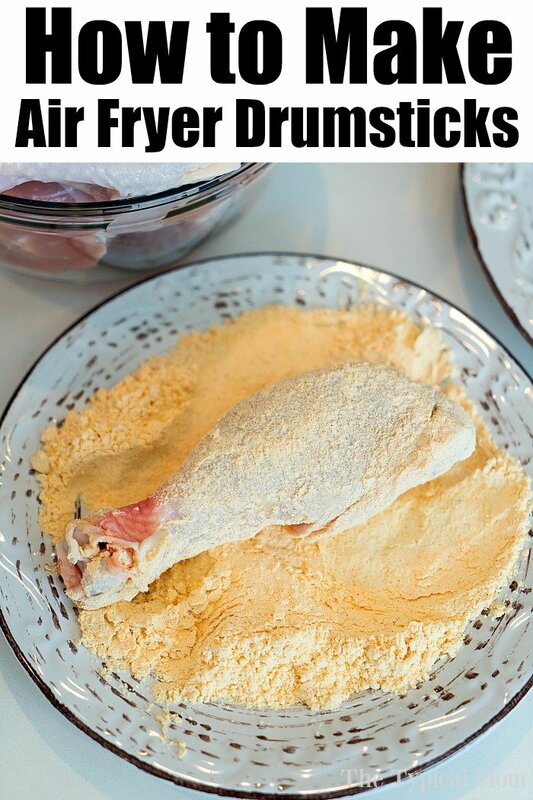 Put drumsticks in a bowl and pour olive oil on top. Rub all legs with olive oil so they are coated well. 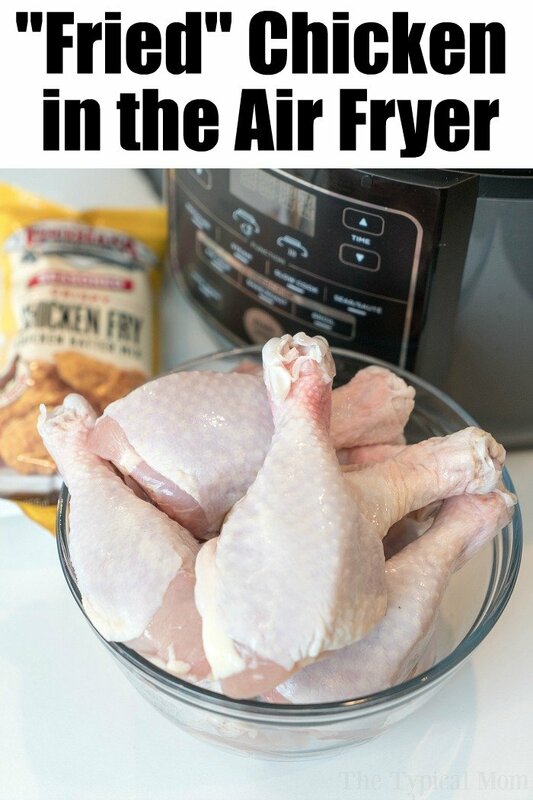 Preheat air fryer for 5 minutes at 375 degrees. 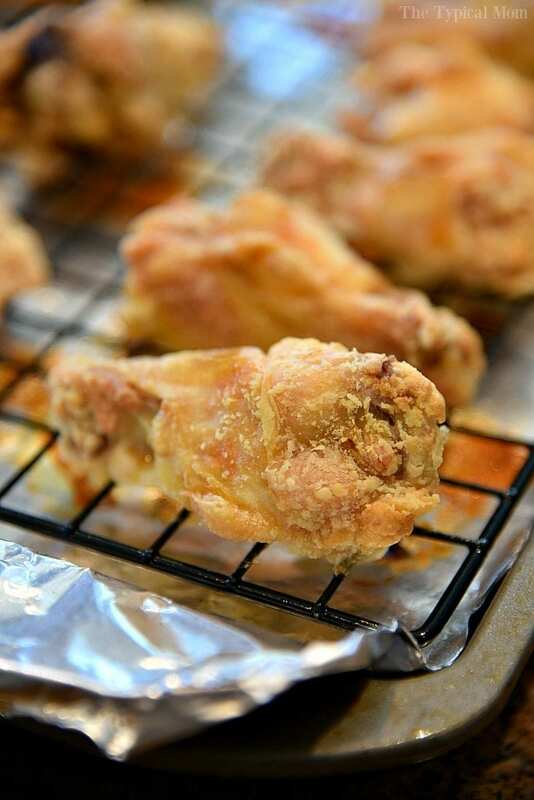 One at a time sprinkle seasoning of your choice all over each drumstick. Or if you are using the bagged seasoned breading we did add mix to gallon baggie and shake with 3 legs inside so they are coated well with powder. When preheated spray the inside of your air fryer basket lightly with non stick spray. Lay legs with meatiest side facing down into your basket so they don't overlap, 4 fit nicely in our Ninja Foodi. Close your air fryer lid and set for 24 minutes. Flip legs after 10 minutes, then continue cooking other side for 12 minutes. After 22 minutes has elapsed open the lid and spray tops with olive oil in a can. Remove and enjoy...then add another batch. I made this chicken for dinner last night, and everyone loved it! IT will definitely go into our regular rotation! What a difference the air fryer makes! Thanks for this recipe! I love all your IP and Foodi recipes. My question is that you say there is a free foodi cookbook, but everytime I click on it, it sends me to a book on Amazon that definitely has a cost. Has this cookbook been sold out? It is free if you use your Kindle.